Home » Jean Paul Gaultier Haute Couture » Royal Couture » Sheikha Mozah Diva » Sheikha Mozah of Qatar » Ulyana Sergeenko Spring/Summer Haute Couture 2014 » ROYAL COUTURE.....Sheikha Mozah of Qatar is in Japan: The COUTURE and Turbans! ROYAL COUTURE.....Sheikha Mozah of Qatar is in Japan: The COUTURE and Turbans! Ulyana Sergeenko Spring/Summer Haute Couture 2014: the original runway look was in a darker navy blue and had red and green flower applique on the bell sleeves. 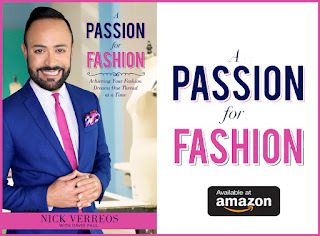 As a client of Haute Couture--who is willing to spend $100,000 for a simple silk ensemble, you can change ANYTHING darlings! In case you don't know who Ulyana Sergeenko is, she is Russian, was a photographer, stylist, Couture client and now became a Couture fashion designer featured in Paris Haute Couture Fashion Week and covered by Style.com. Gaultier Haute Couture: For her 2nd day of Japan visit, H.H. Sheikha Mozah visited the Japanese National Institute of Advanced Industrial Science and Technology. Here she wore a double-breasted pantsuit from Jean Paul Gaultier Spring/Summer 2013 Haute Couture. Instead of the full-to-fit pants, she wore palazzo/wide-legged ones. QELA DIVA: During this Japan visit, the Sheikha also wore a blue ensemble with gold applique waist and center-front/neck detail from her own (gasp!) 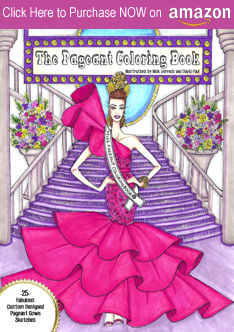 fashion-and-accessory line QELA. Below is an editorial photo of what the Sheikha wore--without sleeves and well, a little more "seductive". Preppy Chic: H.H. 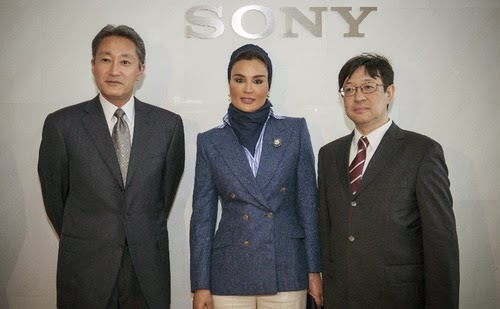 Sheikha Mozah also met with Sony executives during her trip to Japan,--and in this meeting she wore a sensible and very Sportif double-breasted blue jacket with sharp lapels, dress shirt, khakis and full scarf/turban/ascot. Sheikha Mozah & Japan’s Prime Minister Shinzo Abe in Tokyo: For her meeting with Japan's Prime Mininister, H.H. Shiekha Mozah wore an all black ensemble from her new favorite designer Russian Ulyana Sergeenko. All-Black Couture: The high-neck, fitted midriff and attached gathered dirndl skirt look was ordered from the Ulyana Sergeento Fall/Winter 2013 Haute Couture collection. The Sheikha opted to change the sleeves from Leg-o-Mutton to regular three-quarter set-in sleeves. That's her prerogative, of course, since, like I said, when you are ordering a $75,000 COUTURE ensemble, you can change whatever you'd like. 0 Response to "ROYAL COUTURE.....Sheikha Mozah of Qatar is in Japan: The COUTURE and Turbans!"